Rhidorroch is an ideal base from which to explore the north-west highlands – wild and unspoiled, this entire region rightly boasts unforgettable, spectacular coastal and mountain scenery, and there is much to see and do both in nearby Ullapool and beyond. The tranquil wilderness of Glen Achall belies its convenient proximity to Ullapool and the main routes north. Pleasantly busy from early spring through until late autumn, Ullapool – a small, active picturesque Highland fishing village – lies on the shores of Loch Broom. Whitewashed shops and houses line the main street along the sea wall and fishing boats lie alongside the sheltered harbour. The pier is the focal point of the village: here, the local fleet's traditional fishing boats, and others from much farther afield, land their catches of prawns, lobsters and scallops as well as fish. The Outer Isles ferry sails daily from the pier to and from Stornoway on the Isle of Lewis. Crossing the Minch takes about three hours; timings allow a day trip to the Outer Isles. Ullapool has everything you are likely to need. There is an excellent butcher/fishmonger, supermarket, delicatessan, tourist information centre, banks, a post office, garages, a chemist, newsagent, bookshops, a computer store, library and a hardware store plus a number of gift, knitwear and outdoor clothing and sports gear shops. The open air Saturday market sells fresh fruit, local vegetables and baking, plus locally smoked and freshly caught fish as well as knitwear and various other craftworks. The village boasts a variety of lively cafes, restaurants and bars – many along the seafront – where menus include locally caught seafood, Highland beef and venison and award-winning fish and chips. Ullapool has its own Junior Pipe Band. The band is often invited to play at the numerous Highland gatherings in the area and they perform by the pier in the village once a week throughout the summer season. The village hall hosts concerts and events, and visiting music, dance and theatre companies perform at the Macphail Centre theatre and other venues. Most of the local bars and hotels regularly stage live music from traditional Scottish to contemporary. Every few weeks the Screen Machine, a marvellous Tardis-like travelling cinema, rolls in to the village and unfurls its silver screen. The Ullapool News, published every Friday, includes a comprehensive listing of walks, talks and entertainment throughout the area. Facilities at the Lochbroom Leisure Centre include: two outdoor tennis courts plus indoor short tennis and badminton; indoor climbing wall; fitness room; sauna and a heated indoor swimming pool. The pool timetables children's sessions with water toys and floats as well as lane swimming and senior hour for the adults. The centre also offers pilates, yoga and keep fit, and during school holidays often installs an indoor bouncy castle and soft play area. Ullapool Museum features both permanent and visiting exhibitions. Eleanor White at Bridge House Art (in Ullapool) runs full-time, week-long and weekend summer courses and workshops (www.bridgehouseart.co.uk); Highland Stoneware pottery is hand painted and glazed at their shops in Ullapool and Lochinver; textiles and ceramics by Eric and Meira Stockl are on show at Lael Falls House. Further afield at Loch Eriboll is Lotte Glob's Workshop and Sculpture Garden (visits by appointment only: contact 01971 511727 (www.lotteglob.co.uk). Golf Ullapool has its own nine-hole golf course on the shores of Loch Broom. The club welcomes visitors to its 'challenging course, full of character'. Under two hours' drive from Ullapool there are good nine-hole courses at Gairloch, Durness and Strathpeffer. The cliff-top course at Durness boasts a unique challenge with its 'hole over the Atlantic' at the ninth, and Gairloch is probably one of the prettiest courses you'll ever play. The 18-hole course at the Royal Dornoch is a longer journey, but keen golfers will find it's worth every mile. The shore around Ullapool and Loch Broom is perfect for pebble collectors and some bank sea fishing (Ardmair, Dun Canna, Rhue); the sandy beaches lie a little further afield and are very well worth visiting. They are among the finest, and quietest, in Scotland and also offer exceptional surf. 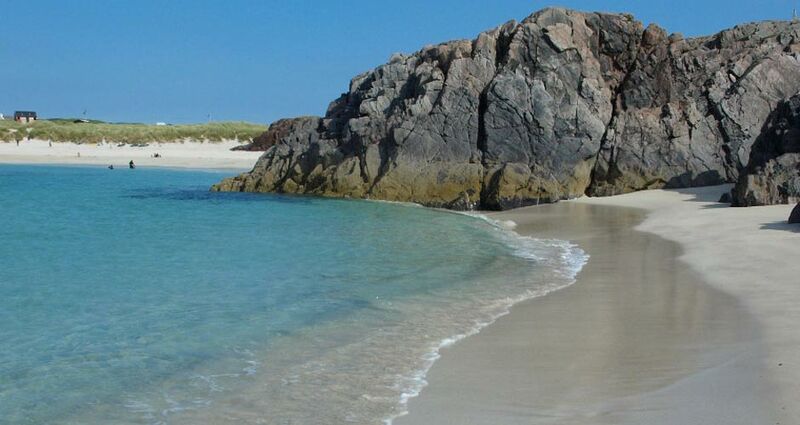 Any of the following is ideal for an easy day out allowing plenty of time to build castles, dig holes, swim and picnic: Balnakeil, remote Sandwood Bay and Oldshoremore – all to the north – probably top the list; Achnahaird (west towards Achiltibuie) – rock pools, huge expanse of white sand, wide open view all the way north to Stoer Point lighthouse and beyond – is the best of the nearest; Mungisdale, Gruinard and Mellon Udrigle lie towards Gairloch and, north again on the narrow coast road which dips and dives between Lochinver and Kylesku, are the pure white sands of Achmelvich, Clachtoll and Clashnessie. From Ullapool, local boats (the Summer Queen and Seascape Expeditions) make trips around the Summer Isles. The coastal scenery is magnificent and marine life includes porpoises, Atlantic grey and common seals, sea birds aplenty and, more rarely, dolphins and killer or Minke whales. From Achiltibuie the Hectoria, a converted trawler, takes visitors to the seal colonies around the Summer Isles. Further north, there are boat trips in to see the stalactites and stalagmites within the vast Smoo caves at Durness, or make the short ferry crossing (May to end of September) to Cape Wrath Lighthouse, built in 1828 – crossing by boat is the only way to reach this remote headland. Handa Island, a Scottish Wildlife Trust reserve, is well worth visiting and ideal for families with young children as the walking is very easy. The ten-minute crossing from Tarbet (about an hour's drive from Ullapool; ferry operates April to end August/early September) lands on one of Handa's sandy beaches, then from the information bothy a boardwalk and path snakes around the perimeter of this gorgeous little island. From mid-May to August the sky here is thick with Arctic and great skuas guarding their nests; until late-July hundreds of puffins sit snug against the steep cliffs and until mid-July 150,000 guillemots dive-bomb the sea. Enjoy a walk around Leckmelm Gardens (three miles from Ullapool). The secluded 12-acre woodland garden by Loch Broom was planted in the mid-19th century and includes some fine shrubs and important trees. A visit to the famous Inverewe Gardens is a must. 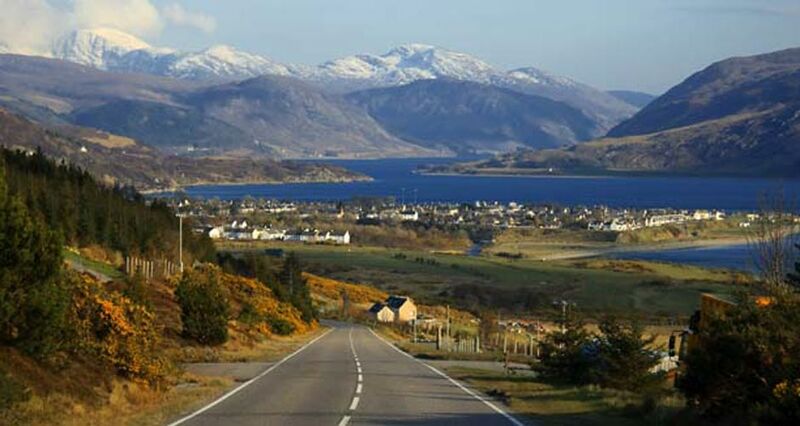 The drive to the shores of Loch Ewe on the scenic coastal route via Dundonnell is a pleasure in itself. In 1862 Osgood Hanbury Mackenzie created the 64-acre gardens on a once barren peninsular site. Now, with the benefit of the warm Gulf Stream currents, Himalayan rhododendrons, Tasmanian eucalypts and a wide variety of Chilean and South African plants number among the 2,5000 mostly exotic species thriving at a latitude more northerly than Moscow. The entire area north, south, east and west around Rhidorroch and Ullapool village is laced with good paths and tracks offering everything from a gentle stroll in the forest to a steep hike up mountain tracks. Nearby, Lael Forrest and its forest garden has an interesting network of marked paths, while coastal walks nearby include the two-mile track from Blughasary or Glutton to Dun Canna – an iron-age fort, now a ruin – and the three-mile walk along the shore from Ullapool to Rhue lighthouse. There is a good, well-trodden path all the way to the top of Stac Pollaidh (613m). Only 30 minutes' drive from Ullapool on the road towards Achiltibuie this distinctive peak is easy to conquer, if somewhat narrow and slippery towards the ridge, and rewards with really breathtaking views to all points of the compass. March straight up and down and the round trip takes about three hours, or make a day of it, take a picnic and make the most of the views. In addition to Seanna Braigh, a particularly remote Munro but accessible from the Rhidorroch estate road, there are more than 20 Munros (mountains over 3000ft/913m) to tackle in the area and many have good walking tracks – there is a good path from Dundonnell up An Teallach (1060m), for example. Closer to Ullapool are the Beinn Dearg and the Fannich ranges, while some of the lower peaks include Cul Mor (849m), Cul Beag (769m) and Ben Mhor Coigach (743m). 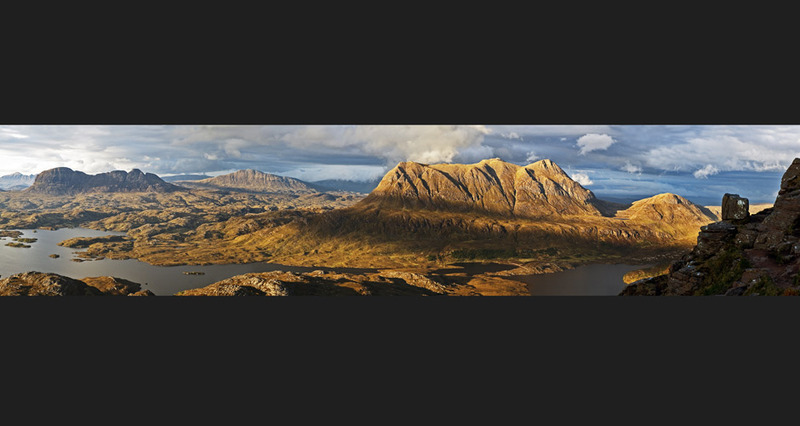 Further north are Ben Mhor Assynt (998m), Suilven (731), Quinag (808m), Canisp (846m), and Foinaven (908m) Arkle (787m) and Ben Stack (721m).